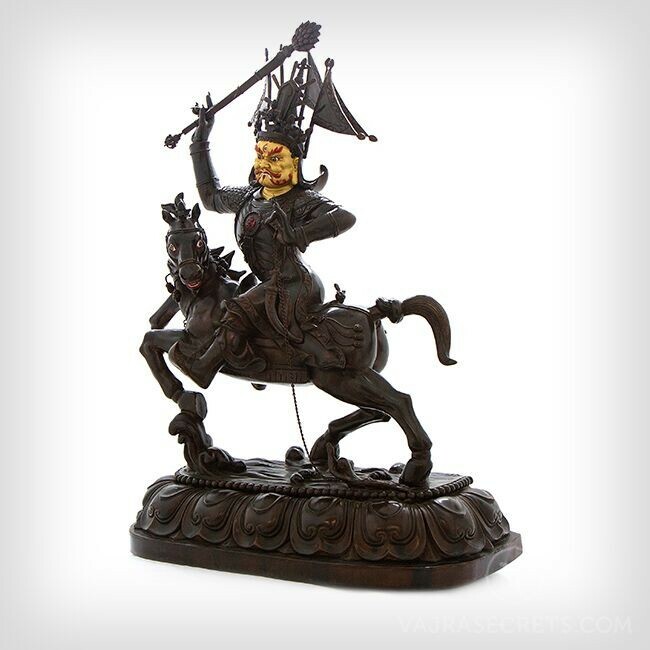 An exquisitely carved copper statue of the Dharma Protector Setrap, who is the wrathful emanation of Buddha Amitabha. Fierce yet compassionate, his image grants powerful protection from negative energies and black magic, provides swift assistance to overcome life's problems, and helps us along our spiritual journey. Features an oxidised finish and traditional hand-painted face in real gold dust. A copper statue of Dharma Protector Setrap, exquisitely carved with full iconographic detail according to traditional scriptural sources, and complete with traditional hand-painted face and breastplate in real gold dust. A perfect addition to any altar or shrine at home and in places of business, and especially in a dharma center. Setrap is the wrathful emanation of Buddha Amitabha, and is the main Dharma Protector of the 600-year-old Gaden Monastery founded by Lama Tsongkhapa. He is known to be extremely effective in providing swift assistance to overcome worldly and spiritual obstacles. Setrap's practice brings success, harmony and peace to all who invoke his blessings. He also grants powerful protection against negative energies, spirit disturbances and black magic. This Setrap statue can be personalised with the insertion of mantras and holy items, body painting, or traditional clothes such as a Tibetan-style tule and pangden made of rich brocade and decorated with pearls and semi-precious stones. H.E. Tsem Rinpoche always encourages the practice of making offerings to the Three Jewels, which creates the causes for us to attain the six paramitas (perfections). * As this is an oversized item, shipping costs for this item are not included at checkout. Please contact us for the shipping and handling costs to your location prior to purchase. * Prices listed exclude other forms of personalisation (e.g. body painting, mantra insertion, traditional clothing, etc). Product images are for display purposes only. * Due to popular demand, stocks of this statue are not guaranteed and may take up to 6 months to ship. Should you require immediate delivery, please contact us to confirm availability before placing your order. The 6 month period does not including shipment time and customs clearance in your country.